I just read an an excellent comment on Eye for Travel responding to Facebook new location-based check-ins, from hoteliers’ point of view. Facebook has removed the location-based check-ins option from its Places Pages and moved it to Facebook Pages. With the move, a hotel and travel company can add locations from anywhere, and from any device, that includes status updates, photos, Page or Wall posts. Facebook is phasing out the Facebook Places feature on mobile devices. The aim is to make all interaction more like Facebook rather than compete with check-in sites like Foursquare. By adding the Place as a descriptor on status updates versus solely being the post, users will still be able to “check-in” to businesses, but through their status updates instead, by adding City Location and Tagging a Business in a post. This is of benefit to businesses as location-based activities is no longer restricted to just mobile devices and is now available on any browser that can read Facebook. Facebook is looking at location as: Where I’m going, Where I am, and Where I have been. It could be a huge plus for hotels to play in the location-based marketing space. This will not have any impact on your hotel’s Facebook Places pages. Applications like http://Facebook.arcRes.biz and http://FanPagePosts.com will be even more effective when couples will map an activity right in the pages created by the apps. Tech Says "smart from a location-based advertising strategy"
Forbes magazine just wrote: "Businesses that thrive in the second decade of the 21st century will naturally build customer communities seamlessly across all platforms: online, mobile, and, yes, even traditional media and the original social media, face-to-face." Jim Blaingame, Forbes. If you have not already watched Clay Shirkly talk about how Facebook, Twitter and all Social Media is changing the business landscape, check this out on my blog at bit.ly/notsosocial-media. Social Media is not about being social anymore. It's about building communities and enabling participation and it's about the changing shape of communications and the media. 1. Communications is no longer one to many, but many to many, between peer groups and individuals where there are many connections and dialogue is bi-directional. 2. Media has migrated to Internet. All Media is beside each other and on your desktop and in your hand. 3. Consumers are publishers. This means a vast expansion in channels and mediators who transpose information relative to their peer group, and even to fragments within peer groups. 4. The network is vast and growing exponentially. The size is the square of the of number of nodes. Messages will be vastly differentiated and targeted. The fact is, all of us have different priorities at different times. There can be many yous: parent, child, family, business person, adventurer, joyful, sad and more based on situation and pretext. So how can one message ever be enough, even for one person? Message must vary to appeal to me and you based on our mood, role and goal. We are not, in tourism, about one thing only, and each aspect of our service will needs its own message and its own audience. Communications then is far more personal and fragmented than we have so far catered for. Now with the emergence of a new communication landscape, which we so far call Social Media, the message is never all things to all people. It is as varied as human behavior itself, adapting to its group and occasion based on its participants at any time in any media. And why; because it is like a conversation where we are not ever a single participant. From many comes the new! AXSES introduces the new Fan Post Engine for Travel and Tourism suppliers. Following up on its arcResBookings.com Platform, this new Facebook application for hotel and tourism companies, builds the Special Offers" Fan page and post your content to it. This new arcRes application for Facebook, developed by AXSES, is one of a series of Facebook Travel Initiatives by the company. First, there was arcResBookings that creates the Reservations page and manages all rates and bookings on a Hotel Facebook Fan Page. 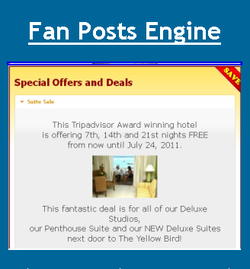 Now FanPagePosts, powered by ArcRes, creates a "Special Offers" Fan Page and posts hotel, car companies and tourism activities to the Fan Page. Special Offers, Packages, Deals and Promotions are great for conversation and engaging Fans. The app also builds the "Like" Page which encourages visitors to become a Fan to see the Special Offers (optional). The Travel Offers are displayed on the next page and available to Fans. They may also be displayed on the hotel or travel brands wall and in Fan news feeds. Check out AXSES blogs on Advertising and Marketing Travel on Facebook. A Facebook Sweepstake is a great way for any hotel, tourism and destination organization to increase fans and interaction with Facebook users. Competitions and liked within the Facebook community and Fans quickly spread the word around to others Fans. Facebook guidelines on how to run a competition and choose a winner are good, and running the competition on Facebook gets good credibility. New York Times on Facebook - AXSES arcResBookings noted! New York Times notes AXSES arcResBookings for Facebook as an app aimed to drive more direct business to hotels. The app is one of a kind, noted the article, giving independent hotels and small chains an easy and effective Content Management System and Fan page booking engine on their own Facebook pages. Christine Blank of HotelNewsNow writes that "Facebook is fast becoming more than a customer relationship tool for many independent properties and chains. Many hotels now offer room-booking technology on their Facebook pages, which is leading to incremental sales". She says real commerce is now starting on Facebook, giving the examples of Delta Airlines' booking engine and Sony offering car rental movies. The booking engines, it seems, are providing value to guests, some who book directly on Facebook and many who get quotes and will then select the hotel they favor. Facebook is becoming very dominant in referring travelers to hotel websites and it stands to reason that those that have the best information, images and services will do the best. It was also noted that the conversion rate on referrals from Facebook was higher that with TripAdvisor. Douglas Quinby, Senior Director of Research for PhoCusWright says, "The conversion rate on direct referrals from traveler review sites to hotel supplier websites ranged from 4% to 6% in 2009, while conversion from Facebook to hotel websites was 8%". Also, 35% of U.S. online travelers interacted with a travel company on an online social network in the past year. PhoCusWright's “Traveler Technology Survey, 2010” shows that 13% of social-network users use social networks to shop for travel. David Godsman, VP of Global Web for Starwood Hotels, advises that the conversion rate on Facebook referrals is close to conversion on Starwood's own brand websites. Westin Hotels and Resorts has a bookings widget that serves up quotes for family holidays and comments that the new booking technology is a important way to engage travelers on Facebook. At AXSES, we are seeing good interaction on the arcResBookings.com Widgets, Quote systems and Content Manager application for Facebook. This allows independent hotels and all tourism to easily get up-to-date with this latest technology. arcRes for Facebook loads all information, rooms, rates, specials, packages, pictures and brand content onto Facebook. It automatically loads the booking widget that gives Facebook Fans the option to get instant quotes and to book. Engage your Fans and get more bookings with arcRes Content Manager and Bookings for Facebook. Stephen Haines, Commercial Director of Facebook's U.K. operation, at the Technology for Marketing and Advertising Conference in London, UK, suggests that "A day might be coming when the power of Facebook means that major companies no longer bother with their own Web sites". Haines points out the numbers speak for themselves when comparing how many times Facebook users have clicked a company's "Like" button with how many times per month people visited that company's Web site. Starbucks had 21.1 million Likes and 1.8 million site visitors. Coca-Cola, had 20.5 million compared with 270,000. Oreo, 10.1 million vs. 290,000. Dr. Pepper, 4.1 million to 325,000. In the U.K., millions of users spend an average of 28 minutes per day on Facebook. Haines says that Facebook can become a platform for your own website, just as WordPress has. He argues that many businesses are turning to 3rd-party Web 2.0 apps and platforms, like Google Blogger and Yahoo Flickr, which are easier to set up than their own custom-built solutions. "Facebook interactions let companies tap into a wealth of customer information and a communication channel." Facebook's targeting tools let hotels and tourism operators access specific demographics like "30-year-olds in London who like cricket and may want to travel to the World Series in Barbados", for example. • Options to offer samples & specials to customers, again available with arcRes for Facebook. • The ability to reach smartphone travelers for local check-ins. "Clothing retailer The Gap gave away 10,000 pairs of jeans to the first 10,000 customers to use the Facebook local check-in service, and Mazda sold 100 cars --exceeding expectations--with a 20-percent-off offer at five U.K. auto dealerships", Haines said. • The ability to build e-commerce options into Facebook pages a-la-arcRes, which let travelers see best rates for Fans and book rooms, cars and tours without leaving the Facebook page. • Advertising to target groups that change many times a day to send a sequence of ad messages to Facebook users. • Surveys that let tourism companies engage customers in company decisions. VitaminWater used voting, among other mechanisms, to generate 1.3 million "connections" with possible customers during its "Find a New Flavor" marketing campaign. • Many Applications built atop Facebook's interface that let companies create custom-made interactive programs. Facebook is also experimenting with new ideas. One is "News Feed Story Ads," in which hotel specials and news can be displayed as advertisements. Also "Application Social Context Ads," where the app shows which contacts are also using the app. Load you Brand content, Fan Specials and Bookings on your Facebook page now with arcRes Publishing. HTC unveiled two smartphones with dedicated Facebook buttons. The buttons give immediate access to Facebook and let you update your status, photos, check places, share music, photo news, etc. HTC displayed two models, The ChaCha and Salsa at Mobile World Congress, in Barcelona. The ChaCha features a full QWERTY keyboard and a 2.6-inch, 480x320-pixel-resolution touch screen, while the Salsa is an all-touch smartphone, with a 3.4-inch, 480x320-pixel-resolution display. Both run on Android and have back-facing 5-megapixel cameras and front-facing VGA cameras for video calls. - Engagement is not Facebook’s strong suit. Impressions returns more to the bottom line. - It requires work to grow and sustain a Fan base. You need a steady flow of the right type of content. - Don't repeatedly post the same under-performing content types. - Video is a booming engagement tool, but hospitality is lagging due to poor quality content, subject matter and execution. This is a huge missed opportunity. - Too much content being posted does nothing to enhance a guest connection. Apple plans to build Niche social networking apps, not websites. Apple still believes that desktop and mobile applications will be the glue to the future of computing. Apple’s recent moves into focuses like Game Center (games) and Ping (music) show this way of thinking. Apple's new projects, like the ‘Find my Friends’ feature in the latest iOS 4.3 beta, indicate that Apple is aiming at the geo-location market, as a component of the its social networks. Apple's apps strategy is interesting, but I don't believe that applications are the way forward as a vehicle to deliver information. Applications are great for delivering services, but completely out of place for website information. "Travelers look at 12 to 20 hotel and tourism websites before making a final choice. Imagine if travelers had to download an app each time they wanted to see a hotel." http://hubpages.com/hub/travel-on-the-go. Mobile websites, like http://travelonthego.mobi, are here to stay, and while Apple's niche strategy is smart, Facebook has a rather large lead and a network that has only just begun to come into its own. Facebook innovation and invention in the Travel arena is just beginning. More on Facebook, see http://hubpages.com/hub/the-facebook-business-model.